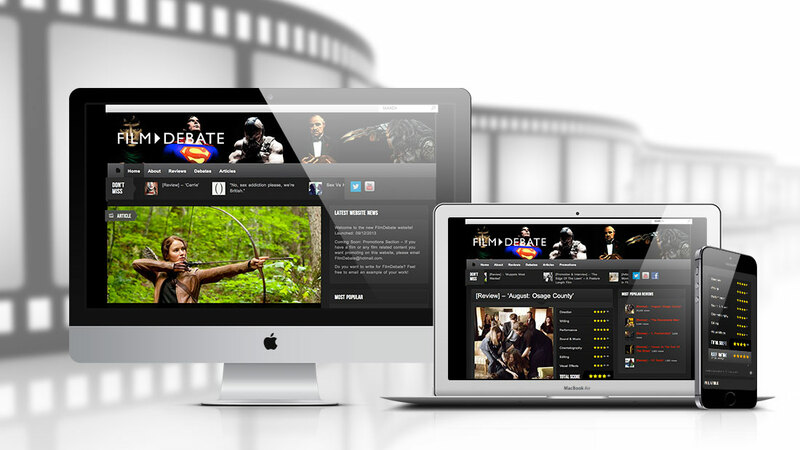 Website design project for up-and-coming film reviewer and journalist, Adam Snowden, and his blog, FilmDebate. Adam began reviewing films for fun whilst studying at university, but what started as a hobby has turned into a fledgling career, as Adam has seen his blog grow in popularity. The next step was clear: to set up his very own website and continue producing high quality entertainment articles on a professional platform, complete with interactive content to provoke conversation, reflecting the blog’s title, FilmDebate. Adam requested a slick, uncluttered site in a dark colour scheme for a professional, contemporary look, and user-friendly features. The new website, a customised WordPress theme, features a classic monochrome colour scheme, evoking the black and white films of vintage Hollywood, whilst innovative interactive details reference the technology of the modern film industry. The interactive website creates a great, collaborative feel, as visitors are invited to provide their own star ratings for the films reviewed, and comes complete with content-managed back office. The website design has also allowed Adam to explore the commercial side of the film industry, as he now features short films in the Promotions area of the site. Perhaps most exciting of all, Adam landed an interview with actor Jon Gries, of ‘Lost’, ‘Taken’ and ‘Napoleon Dynamite’ fame, discussing an upcoming directorial project – long may the Hollywood interviews continue! Review Adam’s website here.